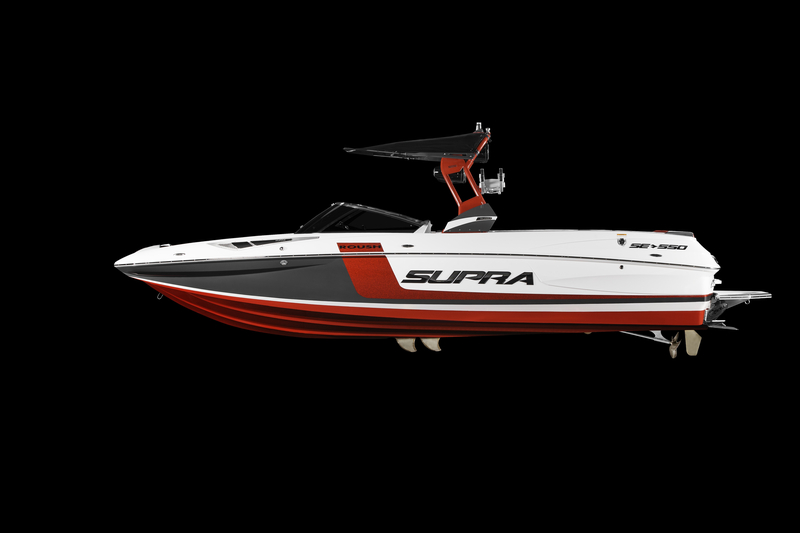 New Supra SE 550 ROUSH-edition boat from ROUSH Performance and Skier’s Choice, Inc. features 500+ horsepower, 575 ft-lb of torque. Slick automotive styling reminiscent of the ROUSH Mustang, including custom metallic colors on the tower and a two-tone hull gelcoat adds to the appeal of the Supra SE 550 ROUSH-edition wake boat. Along with the powerful ROUSHcharged Raptor by Indmar to give watersports enthusiasts an extra kick, we added refined touches to the interior and exterior to make the Supra SE 550 ROUSH Edition a unique owner’s experience. ROUSH Performance and Skier’s Choice, Inc. showcased the first-ever ROUSH-branded boat at the SEMA Show today. 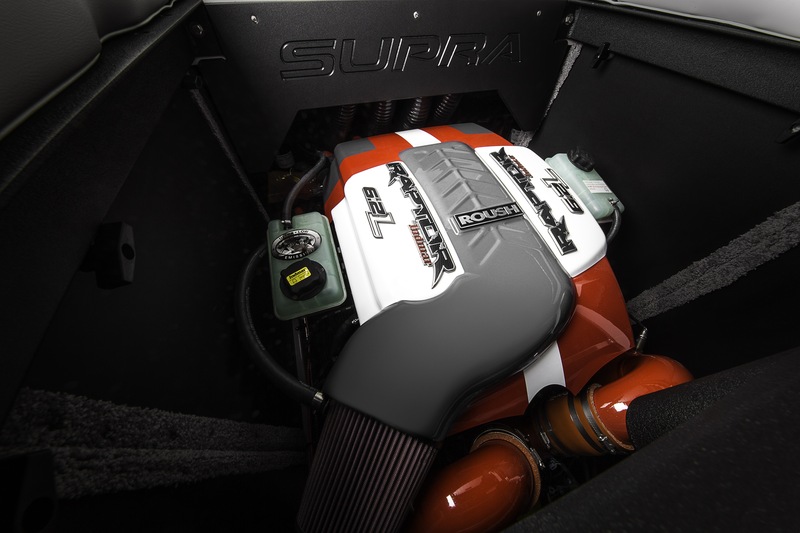 The Supra SE 550 ROUSH Edition Wake boat comes with equal amounts of power and style. With more than 500 horsepower and 575 lb-ft of torque — thanks to an Indmar 6.2L ROUSHcharged Raptor engine — it brings off-road muscle from the street to the lake. Slick automotive styling reminiscent of the ROUSH Mustang, including custom metallic colors on the tower and a two-tone hull gelcoat adds to the appeal. Exclusive benefits include ROUSH styling, more standard features than any boat ever built by Supra, and full customization — all on the largest, most comfortable boat in Supra’s fleet. Performance. Built on the flagship Supra SE, the ROUSH Edition offers high performance features standard, like the 6.2L ROUSHcharged Raptor by Indmar 16-valve, V8 engine, a competition hull to increase wake size and stability, and the Supra Launch System to reduce drag in the water and increase acceleration. Engineering. It contains the latest Supra technology, such as Supra Vision Touch System for easy touchscreen navigation and integrated column and steering wheel controls — an industry first — to keep adjustments at the fingertips while driving. Design. The trademark ROUSH Hockey Stick body stripe is designed into the gel coat, and race-inspired elements are strategically designed into the trailer, tower, interior and engine compartment. For example, a ROUSH Mustang-inspired ball and 18-inch cast aluminum wheels with ROUSH center caps are standard on the Roush Edition trailer. The ROUSHcharged Raptor by Indmar has received three awards for innovative achievement and customer satisfaction: The Boat Writers International Innovation award, Boating Industry magazine’s Top Products of 2015 award, and the National Marine Manufacturers Association CSI award for excellence in customer satisfaction. The Supra SE 550 ROUSH Edition will be available in limited quantity this month through Supra’s dealer network. 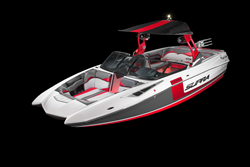 About Skier’s Choice, Inc.: Skier’s Choice, Inc. is the proud manufacturer of Supra and Moomba performance inboard wakeboard and wakesurf towboats. Supra has been a leader in the inboard industry since 1980. The Supra brand is synonymous with innovative styling, luxurious interiors, highest construction quality, and unsurpassed wake performance. Moomba is a value-oriented brand that delivers quality and performance comparable to other inboard brands but at a price significantly less. Moomba delivers the “best bang for the buck.” The company is privately held and is located in Maryville, Tennessee. Skier’s Choice encourages all boating participants to learn and follow safe boating practices. There are risks associated with boating and water sports activities. Be mindful of the risks, familiarize yourself with the environment, know your limits and conduct yourself accordingly. Based in Plymouth Township, Michigan, ROUSH Performance was founded in 1995 by motorsports legend Jack Roush. The Supra brand is synonymous with innovative styling, luxurious interiors, highest construction quality, and unsurpassed wake performance. The trademark ROUSH Hockey Stick body stripe is designed into the gel coat, and race-inspired elements are strategically designed into the trailer, tower, interior and engine compartment. Built on the flagship Supra SE, the ROUSH Edition offers high performance features standard, like the 6.2L ROUSHcharged Raptor by Indmar 16-valve, V8 engine.